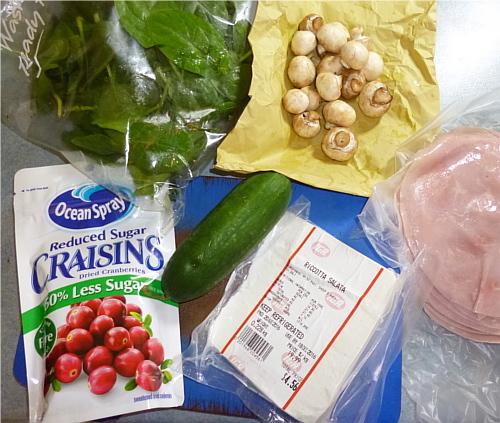 Last weekend, I did one of the things on my Springtime Mori by making a Spring-themed salad for lunch. I didn't use a recipe, but was inspired by what I saw at the supermarket. The first thing I saw were some adorable button mushrooms, which I put in whole. What a shame it would be to cut them up! 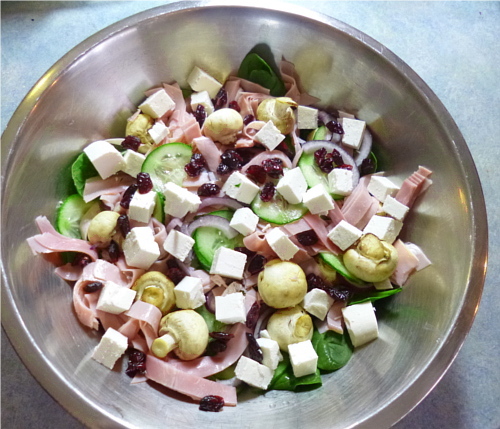 I also added thinly sliced cucumber and red onion, ham, ricotta cheese and rocket. I very much wanted to add some fresh strawberries, but there has been some controversy around the price of berries in Australia lately (I'm not sure on the details) and some supermarkets have stopped selling them. So I settled for some dried cranberries. It really makes me think I should look into growing my own berries, though! Husband whipped up a delicious dressing with some balsamic vinegar, olive oil, lime juice and a few other things. The salad was delicious and just perfect for the beginning of Spring. The only thing I would have changed was to perhaps soak the cranberries in juice for a while to plumpen them up. Next time I'd like to try something with asparagus, I think.